Professional Appearance: A well produced embroidered logo will give the best impression to your clients and customers. There are many different factors that go into producing the highest quality embroidered logo designs. This include everything from the inputting of correct information in to the software for the embroidery machinery to produce the designs right down to the precise tension in the threads to ensure your logo design looks sharp. Our aim is always to produce garments you and your colleagues feel proud wearing. When producing embroidered t shirts we always recommend using a higher quality t shirt to ensure the embroidered design looks best. We offer a range of garments which can feature your company logo embroidery that are styled and tailored for a feminine physique. Branded embroidered work trousers can help to create a coordinated look with upper custom garments. Embroidered work clothes help to keep a uniform look and create brand awareness when your colleagues are performing day to day duties. 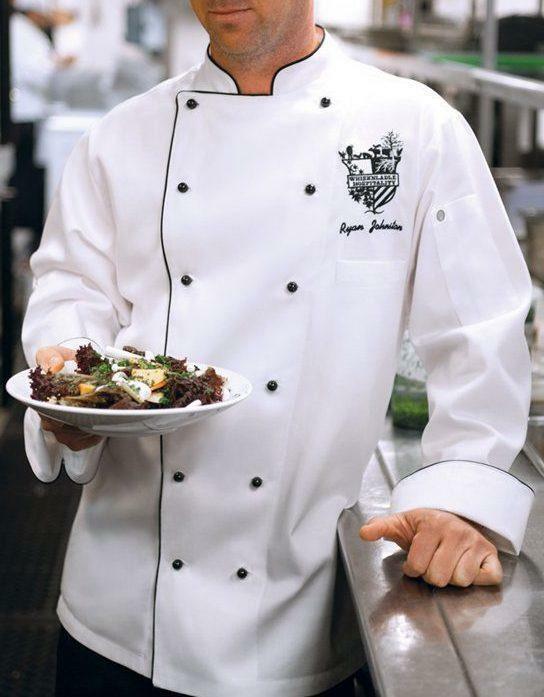 Embroidered uniforms for staff working in the Hotel, Restaurant and Bar environments are usually the best option due to hard wearing properties. Due to garments undergoing regular wash and dry embroidered work wear uniforms for the food manufacturing industry is a very popular request for this sector. Let's Get Started With Your Embroidery Enquiry Today! 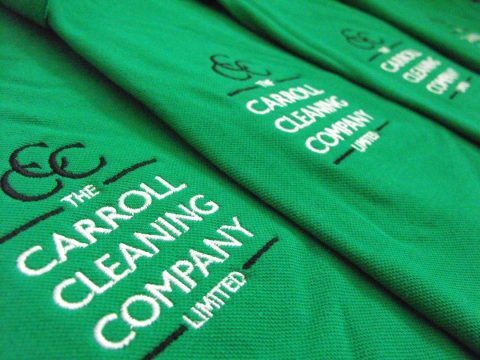 The image shows a close up shot of the quality of our embroidery work onto Polo Shirts produced for specialist corporate cleaning company, The Carroll Cleaning Company Limited. Please click on the big blue button below and furnish us with a few bits of infomation about your embroidery requirements and we will respond to you as quickly as possible.